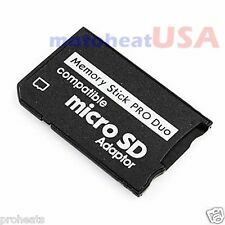 1 x MicroSD TF to MS Adapter CR-5300. This is our SOP, for us to be certain and for record purposes. Capacity: Up to 64gb/ Supports: MicroSD: 256MB - 2GB | MicroSDHC: 4GB -32GB (Any Size Micro SD Card wil work with this adapter). Once mounted, your microSD card acts like any other drive connected to your Mac. Using The MiniDrive (not to be confused with a similar, more expensive product by Nifty) is simple enough. 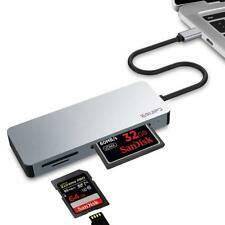 Slide a microSD card into the slot, and insert the whole thing into your Mac’s SD card slot. It also replaces your SD card adapter, since the microSD card fits directly into the reader. When in use, the microSD Card Reader appears as a drive letter (i.e., E:\) and data transfer is as simple as drag and drop. The only way to avoid buying them, is to really know the product in detail and to be able to compare with genuine Kingston. and they all use common Kingston web pictures readily available from Kingston web site, totally misrepresenting the products that you think you will receive. Compatible with: micro sd, sdhc, t-flash, TF card. S upports micro sd card reading and writing. S upports micro sd card upto 64 Gb. 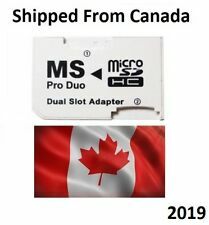 needs no adapter at all. Key features Compact and light weight,smaller than your thumb. 1 x ADATA 64GB Class 10 MicroSDHC Card. 1 x Best Sale USB 2.0 Micro SD Card Reader. 1 x SD Slot Adapter. Waterproof, X-ray proof, temperature proof, and shockproof. 1 x MicroSD to USB Adapter. Premium Red USB. USB 2.0, faster transfer rate up to 480 Mb/s. Size: about 50 x 18 x 11 mm. Support Plug n Play, Easy To Use, No external power required. All our products are 100% genuine. The Transcend RDF5 USB3.0 card reader is engineered to deliver super fast data transfer speeds, and supports next-generation Ultra High Speed SDHC/SDXC and microSDHC/SDXC cards. Plugs directly into the USB port on any desktop or notebook computer, the ultra compact RDF5 offers effortless file sharing in any situation. 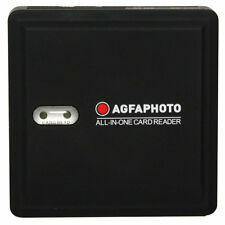 "AGFA 73-in-1 Card Reader f/ SD/HC, Micro SD, CF, XD, MS/Pro Duo and SIM Cards"
It features 7 slots to support 73 types of cards. SIM card function will allow you to back up, sort and modify your phone records from the comfort of the computer. Reads and writes information from and to all cards. Premium Red USB. 1 x Premium Red USB. USB 2.0, faster transfer rate up to 480 Mb/s. Direct Deposit Size: about 50 x 18 x 11 mm. Direct Deposit. Support Plug n Play, Easy To Use, No external power required. Easily slide it into your pocket, bag or suitcase with provided bag, preventing from scratching your macbook. It also instantly transfers your slotMusic songs to your PC or Mac. Fits one MicroSD TF Trasnflash card. Quickly read information in TF card of cell phone and car recorder; CRS12 can be used as a U-disk when paired with TF card. 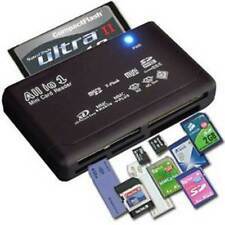 Superior USB3.0 powered TF card supported Support cell phone and tablet to read or write. This versatile device reads SD, SDHC, SDXC, UHS-II and microSD/SDHC/SDXC, UHS-I and supports the latest card speeds. Vendor: Kingston. USB 3.0 multi-function card reader. Card reader. local pickup. We do not aim to profit from freight. SD ,SDHC ,SDXC. The only way to avoid buying them, is to really know the product in detail and to be able to compare with genuine Kingston. and they all use common Kingston web pictures readily available from Kingston web site, totally misrepresenting the products that you think you will receive. Converts your microSD card to a SD card. Allows you to use MicroSD in SD card slots. MicroSD to SD Adapter Adapter for next-generation Ultra High Speed microSD/microSDHC/microSDXC cards. Adapter for next-generation Ultra High Speed microSD/microSDHC/microSDXC cards. PICK UP OPTION. ODROID-C1 /C2 Case. 1 x ADATA 16GB Class 10 MicroSDHC Card. Easily transfer photos or video to your PC. Format: SDHC. Capacity: 16GB. 1 x USB 2.0 Micro SD Card Reader Blue. 1 x SD Adapter. SanDisk Extreme PRO CFast 2.0 supports speeds that professional photographers and videographers need to quickly download high-resolution photos and Full HD videos. USB 3.0 interface supports transfer speeds up to 500MB/s making your post-production workflow up to 10 times faster than USB 2.0 interface.